PSI – This is a measure of pressure (Pound-force per Square Inch) and each tire has a PSI range stated on its sidewall, for example “55-85 PSI”. A flashlight can be helpful when searching for and reading these numbers. As you gain riding experience you will get a sense of your preferred pressure within the stated range. Inner Tube Valve – the tube inside your trike’s tire will have either a Shraeder Valve (looks like a car tire’s valve) or a Presta Valve (narrower and longer). Pump – There are several options for inflating your tires: a floor pump is handy to keep at home, a hand pump to keep with you on the road, or an air compressor to use with care. Many pumps have pressure gauges to measure your psi. Most pumps can accommodate either Presta or Schrader. You can also purchase a Presta to Schrader adapter at most bike stores. Please check your tire inflation regularly. All tubes will lose air over time, and riding on under-inflated tires is unsafe, lessens your enjoyment of the ride, and damages equipment. As you accumulate miles, wear should appear evenly across the middle of each tire. Off-center wear or “scrubbing” may indicate wheel misalignment and you’ll want to bring your trike in for mechanic examination (usually, though, you’ll notice the trike “pulling” to one side long before you see wear). And it’s worth repeating, to properly care for your tires, it’s crucial they be correctly inflated for every ride. Under-inflated tires will break down the sidewall leading to premature failure. 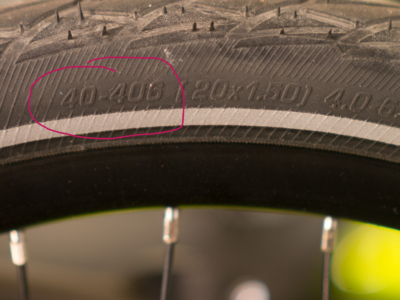 Inflation ratings are embossed into the tire sidewall (though you may need a flashlight to read them). Because all butyl rubber inner tubes have some permeability –allowing air to gradually escape – we recommend filling up at least every couple weeks. 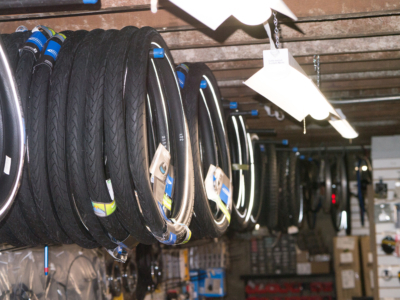 When it’s time to replace them, sizing tires and tubes is very-straightforward. 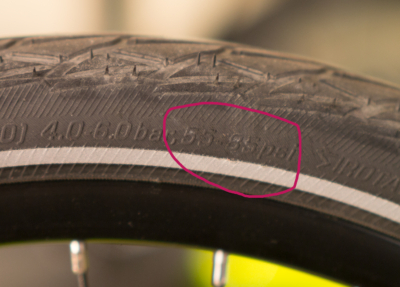 Like PSI, tire size is embossed on the sidewall. However, do NOT pay a bit of attention to sizes marked in inches. The only accurate sizing that matters is the ETRTO number (“European Tyre and Rim Technical Organization, for you geeks). The ETRTO number is a “two digit dash three digit” number such as “35-406” or “47-559”. ETRTO is exact whereas “20 inch” is approximate (yes, seriously, there are at least two official “20 inch” tire sizes. If you call a bike store asking if they “have 20 inch tires,” you may get a 20 inch that doesn’t fit!). Tubes, unlike tires, are sized in ranges –such as “28-406 to 35-406” (meaning it will fit any size 406 tire with a cross-width between 28 and 35 mm). When sizing a tube, choose the smallest one that fits your needs. So, if your tire is 35-406 and your tube choices are either “28-406 to 35-406” or “35-406 to 40-406”, you’ll want the smaller one. Nobody likes flats! Fortunately, RPDX has lots of ingenious, easy-to-use tools to help you change them. We’re happy to show you how to use them. Schwalbe is the dominant brand among recumbents by offering more choices in recumbent-specific sizes than any other manufacturer. Unsurprisingly, then, Schwalbe Racer or Tryker tires come factory-standard from Catrike, HP Velotechnik, AZUB, Greenspeed and virtually every other recumbent bike and trike. Racers and Trykers are quality, lightweight and low-friction tires good for +/-3000 miles (“+” if you ride like a normal human and “-“ if you ride like me and think it’s fun to lock up a wheel drifting around corners at high speed!). Puncture-resistant tires have a 5mm band of highly-elastic rubber under the tread layer that captures and imbeds goat head thorns, glass and other debris before it can reach the tube. Schwalbe calls their Marathon Plus tires “flat-less” and, based on our customer experience, they aren’t over-selling. Knobby tires – while the factory-supplied Racers or Trykers are fine for on-road, bike paths, crushed gravel rails-to-trails or even limited mountain triking, some folks need additional traction in wet, mud or rutted gravel roads. Knobby tires give that extra traction. Designed to run at lower inflation, they give a surprisingly cushy ride. There are some downsides, though –The “knobs” are louder on pavement and the lower pressure requires more rider energy to turn the cranks. 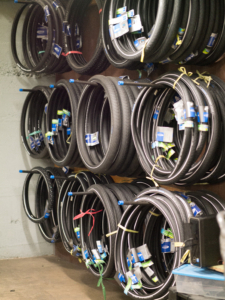 RecumbentPDX keeps the largest inventory of recumbent-specific tires and tubes in the Western United States. We also have a variety of ingenious tools to help you quickly and safely fix flats. 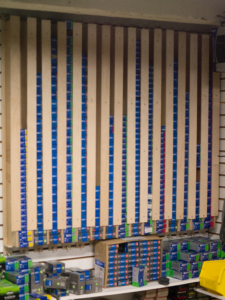 Come on in to the store and we’re happy to show off everything we have. Limited hours last week of March.